The white bower vine is Pandorea jasminoides alba and the cultivar ‘Lady Di’ with its wonderful large white flowers is an excellent form. 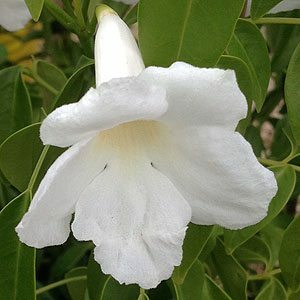 Also known as the ‘White Trumpet Creeper’. An excellent evergreen climber that works well as a feature climbing plant on a trellis or as a ‘cover up’ for a fence or shed. Pandorea jasminoides alba also works well as a cascading plant and can be planted on the edge of a retaining wall and left to hang down gracefully. As an Australian Native plant Pandorea jasminoides alba is exceptionally hardy and copes well in most of the temporate region of Australia except the alpine areas. If you can provide a cool root run and use only a specialist native plant fertilizer generally it will thrive. Plant Pandorea jasminoides alba where it can get some support, shaded and well mulched root run wherethe plant can reach into the sun. Landscaping Uses – Climber on a fence, cover up a shed, grow on a pergola, use as a feature on a pole or obolisc, or overhang a wall. Will tolerate light frost, but not heavy frost.